This is my first completion of the year! I have signed up for a paper piecing bee where we make 3/4 blocks for each person, for 6 months, as well as read a book or watch a movie. The book/movie for January is "The Giver". I haven't made time to get the movie yet, but I will! 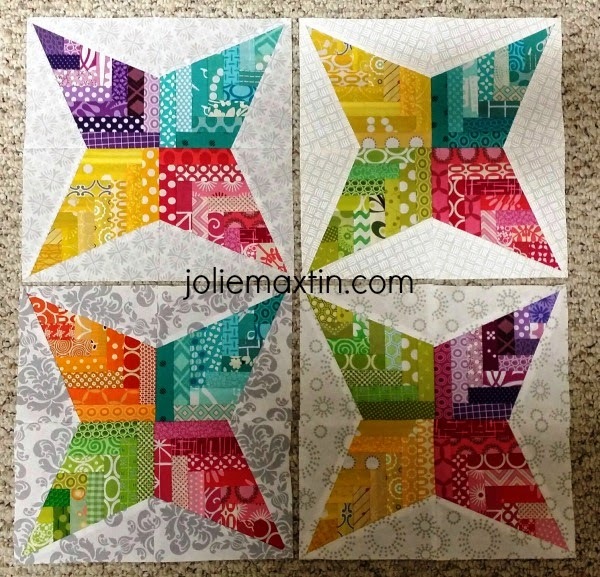 These blocks are a fantastic way to use up scraps and are going to Tiffany. They were fun to make and I think this quilt will be beautiful! There are a handful of us quilty/crafty/sewing gals that participated in a swap for Christmas and I hit the jackpot! Last year I mentioned that I really wanted a sew-together bag, but was afraid to sew it myself because all those zippers! Well well well, I got one - and the special touches are so perfectly suited to my style. The colors are fabulous and the outside is a minimal design with a pop of color, in this case a granny square and a tea wallet too (I LOVE tea). As I opened each zipper another treat was hidden. I was like a kid at Christmas. 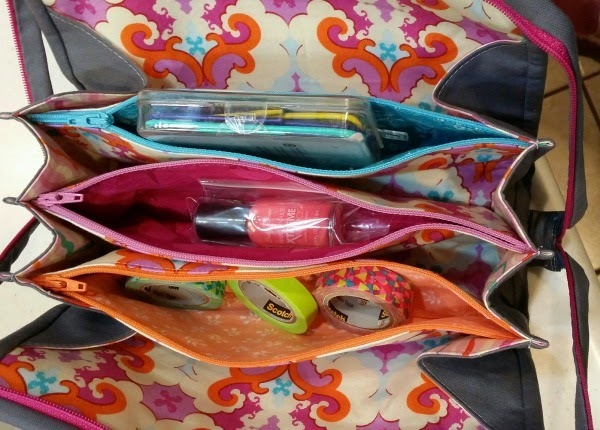 Some washi tape and a jumbo bag of chewy sprees too - yippee! Thank you Lyanna - it's perfect and you are awesome. That is all. I love the Finish-A-long! Something about publically putting out there what I want to accomplish really does make me get it done! Other than the pillow swap (which may be delayed to later in the year so it won't count), I have started all of these - yikes! That's a lot of projects. I'm looking forward to all of them for various reasons so stay tuned for many finishes. How has your new year started? Do you have any UFO projects you are looking to finish up? What about the sew your stash movement? I am on a fabric diet myself...we'll see how long that lasts, but I really do want to not purchase any more - I'm running out of room. Happy New Year! Welcome to another stop on the Around the World Blog Hop! I was asked to join in by Lori of Lori Hartman Designs. We have hosted swaps together as well as helped along young chapters of our respective Modern Quilt Guilds. She is uber creative and you should swing by to see what she has been working on lately. This being the new year, I have some grand plans. About half a dozen UFO's that I would really love to finish as well as a Husker t-shirt quilt and a very personal quilt for one of my dearest friends. 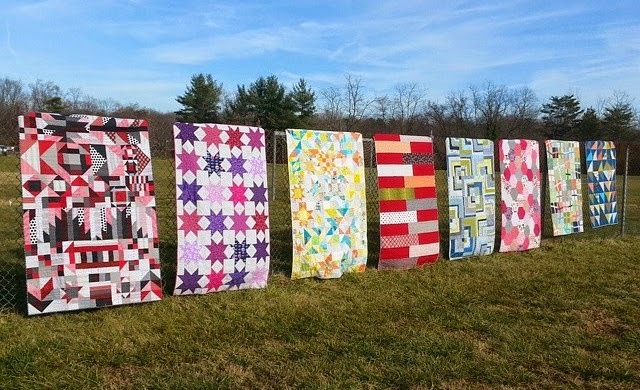 And, because I can't say no to my great sewing circle, I am signed up for a paper piecing bee (3 blocks a month), a traveling quilt, a pillow swap and birthday club. Quarter 1 will be busy. I love it! 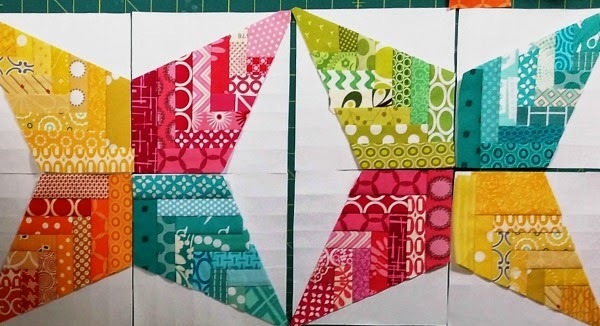 Here is a progress shot of those paper pieced blocks I was telling you about. They will have a low volume background and this quilt will be stunning! I love making things for other people and also for myself. The process of selecting fabrics, contemplating designs, auditioning fabrics and then seeing a finished product fills me with great satisfaction. Additionally, when you make something for someone and they love it, it just warms my heart. This is a great time to introduce you to Lyanna of Blue Striped Room. We met a couple of years ago at a Sewing Retreat and I am in awe of how productive she is while being a mom to five kids. 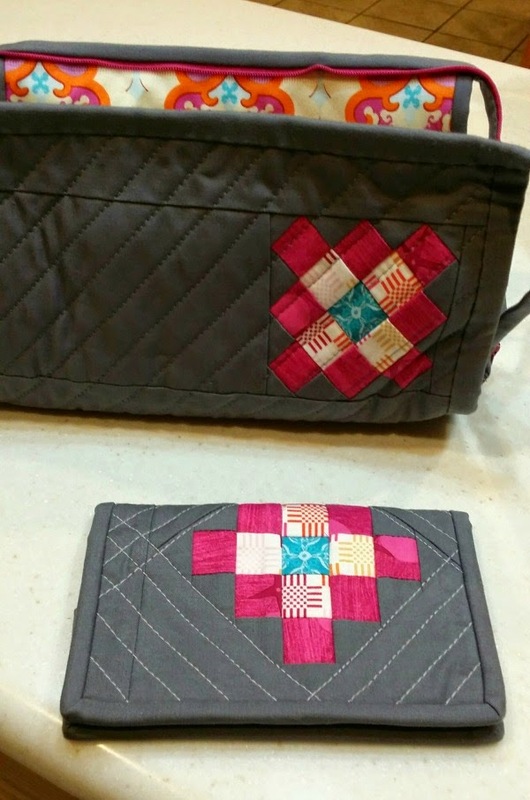 Head on over to see her recent projects which include a cargo bag and a sew-together bag, along with lots of quilts for Christmas gifts. Here is a great shot of her holiday finishes - gorgeous!